If you have been hurt or have a medical condition that makes you unable do the job you once did, you may be entitled to Social Security disability payments. You should be aware, however, that it is not always easy to get the benefits you should be getting from the Social Security Administration. Sometimes it takes considerable effort and the help of an experienced Social Security disability lawyer to get the money you need to care for yourself and your family. I help clients work through the sometimes confusing process of getting their Social Security disability benefits. With over 15 years of experience in this area, I have the expertise you need to successfully apply for benefits or appeal a denail of your benefits. The standard understanding of disability does not always match up with what the federal government defines as “disabled”. Many people who are familiar with the Americans With Disabilities Act (ADA) assume that its definition of “disability” is the same definition used by the Social Security Administration. However, this is not the case. The Social Security disability program has a very different definition of a disability than the one used in the ADA. The Social Security Administration’s definition of a disability is much stricter than the ADA’s – meaning that it is significantly harder to prove to the Social Security Administration that your condition meets their definition of a disability. It makes sense that the different programs use different definitions, because the ADA is intended to help workers with disabilities find and maintain employment, and Social Security Disability benefits are intended for people who cannot work. However, the multiple definitions of “disability” can be confusing. You can apply for your benefits at www.socialsecurity.gov or the nearest Social Security office. You do not need an attorney to apply for social security benefits, but you should be prepared for a struggle after you submit your application. The majority of social security claims are initially denied by the Social Security Administration. You will probably need to appeal the decision, in which case the help of an experienced attorney can prove invaluable. Will Social Security Send Me to Their Doctor? The Social Security Administration contracts with physicians to perform physical examinations and render opinions regarding a claimant’s ability to perform certain physical activities. Social Security makes a determination as to whether or not they would like you to be evaluated by one of their doctors. In most cases, they do not set up an examination. Exams can be done by a medical doctor or a psychiatrist. The examinations are usually very brief and almost always unfavorable. The good news is that the Judge hearing your case is required to give the opinions of your treating physicians more significant weight then the Social Security consultant. If you have gone to a Social Security doctor who has issued an unfavorable report, do not be overly concerned. While that report is not helpful, there is a good chance that the Law Judge will not rely heavily on its contents and conclusion. The Social Security Administration is a complex organization that is focused on ensuring that all applicants meet the stringent requirements for benefits. It can deny your claim for numerous reasons, many of which you will be unable to predict until you are notified of denial. You may not provide what the organization considers sufficient medical evidence of your disability. The organization may mistakenly think that you can still do your original job or a similar job. One of the greatest benefits to working with an attorney is that he can help you prove your eligibility – correcting any and all errors on the part of the Social Security Administration. It may take some time and several attempts, but your attorney can push through the resistance and get you your deserved benefits. The specific amount you will be paid from your benefits is determined by the Social Security Administration using a complex formula. Several things will be considered when determining your payments, including how much you have paid in Social Security taxes and how much you were expected to make over your lifetime based off of your previous earnings. The Social Security Administration offers a benefits calculator, where you can input your information and get a general idea of what you will make should your application be successful. Social Security disability benefits can easily be several thousand dollars a month, making it worthwhile to pursue your benefits – even if you have been initially denied. Recently, a client of mine who has been approved for and is receiving Social Security Disability payments had his bank account emptied as a result of a Judgment that had been previously entered against him. Under Section 207 of the Social Security Act, creditors may not garnish Social Security benefits. If the bank account in question contains co-mingled funds, that is Social Security benefit payments together with other non Social Security money, one may be required to demonstrate what portion of the funds were in fact Social Security benefits. However, if the source of all of the money is the account which has been drained represents Social Security benefits, then that money should be refunded by either the bank or the creditor who attached the assets. Can You Receive Social Security Disability Benefits And Workers’ Compensation Payments At The Same Time? Yes. However, there is a maximum amount that someone can receive when his or her Workers’ Compensation and Social Security benefits are added together. The Social Security Administration will review a claimant’s earning history during the five years before they became disabled. They will select the year with the highest earnings during that time frame. 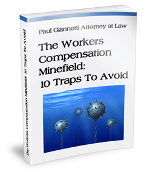 The claimant can receive only 80% of that amount including both Social Security and Workers’ Compensation benefits. If the amounts payable from Workers’ Compensation and Social Security exceed the 80% figure then the Social Security benefits, not the Workers’ Compensation benefits, will be reduced accordingly. For this reason, it is crucial that the Social Security Administration be advised if and when Workers’ Compensation benefits are increased, decreased, or suspended. When a Social Security Disability hearing date has been set, our office will often schedule a face-to-face meeting or teleconference with you a few days before your hearing. At that meeting we will explain, specifically, the type of questions that will be asked. We often do a “simulated hearing” where I ask the questions that I expect the Judge will be interested in and allow my client to answer as if we were in the hearing. That gives us an opportunity to critique the testimony and give tips regarding the best way to explain answers to the Law Judge. In the Albany, NY/Capital District Area, each and every Law Judge will routinely ask a question regarding your ability to perform routine daily activities. Some Judge’s will ask you to explain in detail how a typical day in your life unfolds, from the time you wake up in the morning until the time you go to bed at night. This question often elicits the most telling response for the Law Judge in making a decision in your case. It can be helpful for you to write out an answer or at least make notes regarding the particulars of your daily activities. Sometimes it is difficult to remember all of the minute-to-minute, hour to hour difficulties that you may have as a result of your disability. Because you have lived with them for so long, they have become a way of life. It is important that the Judge hears all of the details regarding your daily activities and limitations. Making a list is a good way to remember them all. In preparing for your hearing, there is no limit to the number of questions or types of questions that a particular Law Judge may ask you. Nonetheless, we will thoroughly prepare you for your Social Security hearing so that you will be in the best position to receive a favorable decision. If you have been hurt or have a medical condition where you can no longer work your job, you have a tough road ahead of you. It will be difficult to ever make the kind of money you were making before, if you can even work at all. Social Security disability benefits may be the only reliable source of income you can depend on in the coming years. As your attorney, I will do whatever it takes to see that you get your benefits. I have helped numerous clients in circumstances similar to yours. The Social Security disability system is complex and can often be frustrating, especially if you are not familiar with it. I can help you navigate the system and can do what is necessary to make the Social Security Administration see the truth – you have a right to your benefits. If you are interested in filing for SSD or you have been denied after your initial filing, please contact me now to discuss your situation. Initial consultations are free, so talking to me will cost you nothing. Once I understand your circumstances, I can tell you the next steps that need to be taken to ensure that you get the benefits you deserve. 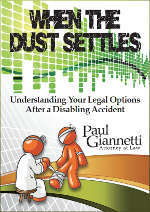 Contact Paul Giannetti Attorney at Law now to schedule your free consultation.